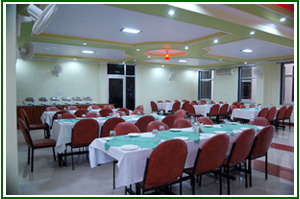 Ranthambhore Paradise is a three storied well furnished hotel, with air conditioned rooms a multi cuisine restaurant of sixty covers, an air conditioned conference hall with sitting arrangements & the only hotel that offers you lift facility in the town. Ranthambhore Paradise is situated near the national park in Ranthambhore. The hotel is 165 kms away from Sanganer Airport, and the nearest railhead is in Sawai Madhopur, which is 1 kms away from the hotel. The hotel also provides sightseeing packages to the tourists. Ranthambhore National Park is in Sawai Madhopur District of Rajasthan state. Located at the junction of the Aravalli and Vindhya hill range, this is one of the finest places to view animals, especially as they are used to being stared at here. The park covers an area of approximately 400 sq Km and if combined it with the area of Sawai Mansingh Sanctuary area, it is around 500 Sq km. Ranthambhore National Park was declared a wildlife sanctuary in 1957 and in 1974 it gained the protection of “Project Tiger”. It got its status of a National Park in 1981. Ranthambhore National Park is dotted with structures that remind you of bygone eras. There are many water bodies located all over the park, which provide perfect relief during the extremely hot summer months for the forest inhabitants. A huge fort, after which the park is named, towers over the park atop a hill. There are many ruins of bygone eras scattered all over the jungle, which give it a unique, wonderful and mixed flavor of nature, history and wildlife. Tigers at Ranthambhore National Park have been known to even hunt in full view of human visitors. These Tigers are famous for being seen in the daytime too, due to their lack of fear of human presence in vehicles. This lack of fear of humans is excellent for tourists, as they get to see the tigers often. This National Park is a wildlife enthusiast and photographer’s dream. It offers excellent accommodation and internal transportation facilities. The park remains open every year from October to May. Famous for the exciting and frequent tiger sightings captured dramatically in several books, this park is today affected by ecological pressures and poaching.